A-HOTEL.com - Luxusní i levné ubytování Twin Waters, Austrálie. Ceny a rezervace hotelů, apartmánů v Twin Watersu a okolí. Toto je orientační nabídka nejvíce rezervovaného ubytování v Twin Watersu za poslední dobu. Je řazena podle ceny, od nejlevnějšího ubytování až po nejdražší hotely. Pro výběr podle Vašich preferencí doporučujeme vybírat z celkem 5 nabídek ubytování v Twin Watersu. Po zadání dat svého pobytu a použití filtru si můžete vybrat nejlepší možné místo na přenocování v destinaci Twin Waters. Zadané datum pobytu je pro přesný výběr místa na přespání klíčové, neboť se od něho odvíjí veškeré on-line informace o cenách a obsazenosti ubytování. Vybrané Twin Waters ubytování (hotely, apartmány, penziony apod.) je pak možné ihned rezervovat. In the Sunshine Coast, Magnolia Lane Holiday Apartments overlooks Twin Waters Golf Course. Units offer excellent amenities. Situated on Queenslands Sunshine Coast, the Novotel Twin Waters Resort is set in tropical gardens surrounding a central private lagoon with its own sandy beaches. The resort offers an extensive range of activities including complimentary water sports, an outdoor heated swimming pool and spa and a gym. Ideal for exploring Australia’s Sunshine Coast, these modern apartments are nestled halfway between Noosa Head and Mooloolaba and offer guests exclusive facilities. Bordering Mudjimba Beach and a large lagoon, The Sebel Twin Waters are a great base for families. Located in Twin Waters, Between River &Sea has an outdoor swimming pool and a garden. Free WiFi is available. Featuring Victorian decor, Bli Bli House Riverside Retreat offers stylish accommodation with free Wi-Fi access. A 5-minute drive from Mudjimba Beach, this half-acre property features a garden, an outdoor seating area and a reading nook. 24 Sundew Street, Mudjimba - 500 Bond - Pet Friendly, Linen Supplied, WIFI, Air Cond. Is set in Mudjimba. Located opposite Mudjimba Beach, Santorini Twin Waters boasts a tennis court and an outdoor pool. It is a non-smoking property and offers self-contained apartments with a spa bath, free WiFi and a private balcony overlooking the ocean or park. Just 10 minutes’ drive from central Sunshine Coast, The Esplanade Holiday Apartments features apartments with free Wi-Fi and a private balcony offering beautiful views of Maroochydore River. The property boasts an outdoor pool and spa. Featuring an outdoor swimming pool, Crystal Waters Picnic Point is set in Maroochydore, within 2.3 km of Cotton Tree Holiday Park. Reflections Holiday Apartments is located on the absolute waterfront, at the end of a peaceful cul-de-sac. This modern property offers self-contained apartments with a balcony and a full kitchen. Mudjimba Sands, Mudjimba, Pet Friendly, BOND 500, LINEN INCLUDED, WIFI is situated in Mudjimba. Guests staying at this apartment have access to a fully equipped kitchen. Just 2 minutes’ walk from the Maroochy River, Wunpalm Motel features an outdoor swimming pool set in lovely gardens. It offers air-conditioned rooms with garden views. 18 Northbeach Place, Mudjimba Beach - Pet Friendly, Linen Included, WIFI is set in Mudjimba. The property is 27 km from Noosa Heads and private parking is featured. 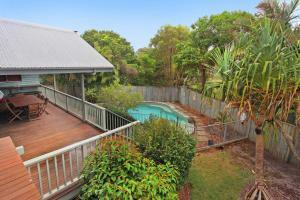 Set in Mudjimba in the Queensland region, 3 Sulo Court, Mudjimba - NEW LISTING has a balcony. The air-conditioned accommodation is 27 km from Noosa Heads. Offering a sauna, a hot tub and a swimming pool, Banyandah Towers are just 5 minutes’ drive from Maroochydoore Beach. All accommodation features a flat-screen TV and a kitchen or kitchenette. Bayz on the River is a self-catering accommodation located in Maroochydore. FreeWiFi access is available. Offering free Wi-Fi, a swimming pool and a BBQ area, this refurbished motel is just 4 km from Mudjimba Beach and Marcoola Beach. All rooms offer a flat-screen TV and a desk. Featuring air-conditioned accommodation with a balcony, 53 Northbeach Place, Mudjimba is set in Mudjimba. The accommodation is 27 km from Noosa Heads. 10 Pavilion Court, Mudjimba, WIFI, Linen Included is situated in Mudjimba. The air-conditioned accommodation is 27 km from Noosa Heads. These luxury self-contained apartments are located right on the water’s edge in the centre of Maroochydore. Facilities include a heated outdoor pool, BBQ area and a private jetty and pontoon.